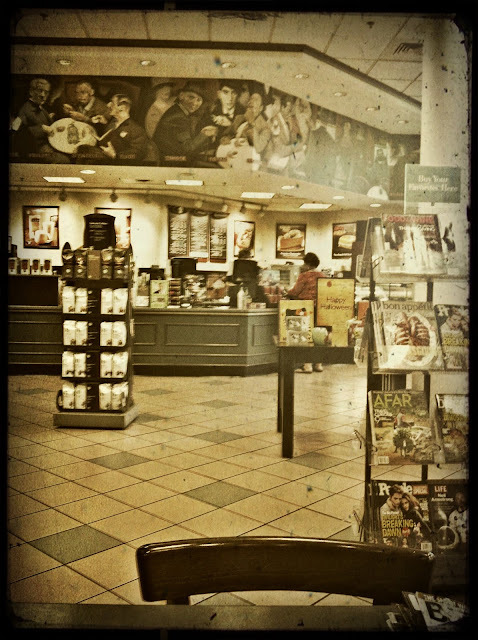 Before Ed went to the doctor and to go check on the truck in the shop, he dropped me off to waste a few hours at Barnes & Noble. We've been home for two weeks now, having maintenance done on the truck and having a coolant leak looked at. I don't need to hold his hand at the doctor and I certainly have no interest in listening to guys talk about truck repair stuff. But while the truck was in the shop, we took care of a few things we haven't had time to do. I went to the dermatologist, as I already mentioned in another post, and Ed took care of his stuff. I have another appointment later in the week for a general checkup, which should be a quick in and out. We usually never do this stuff all at once, but it just worked out that we were home, which is good since I made my appointment over a month ago in hopes that I'd be here - I never thought I actually would be. Tomorrow is Halloween, and I have no plans other than a Skype meeting in the afternoon. Isn't technology amazing? Ed and I have been approached by the editor of a new trucking magazine about us doing a column, so we're going to have a little chat with her and see what's she's looking for. I'm looking forward to hearing about her vision for the column. Perhaps we should wear costumes since she'll be able to see us. It is Halloween, after all. With all this Hurricane Sandy stuff going on, I'm expecting that we're going to be getting a few calls for team loads headed to the East Coast. Since we're out West, there may be things here in the dry barren desert that people in the rain and snow soaked East might need. Usually with events like this, some FEMA stuff comes up to keep us busy. Fingers crossed. Hope everyone makes it through the storm without too much damage, as I know it's hard to determine what's going to happen when all you hear is screaming wind and driving rain. This is all reminding me of last year when we were in Turks & Caicos during Irene, but we made it off the island just fine! Congratulations by getting drafted by another magazine! What kind of leak does the truck have?